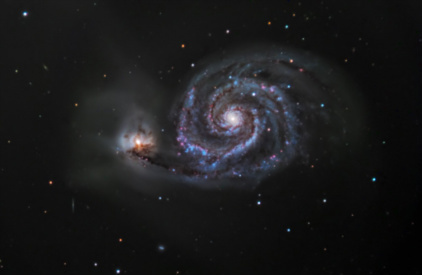 The color picture, LRGB, of the M51 Galaxy was taken 5->7. March-2010. Meade LX200ACF 16" telescope used with 0.5X Optec NextGEN Widefield reducer mounted. An SBIG ST-8XME camera also used and mounted with astronomik LRGB filters. Additionally a 2" IDAS LPS filter used to reduce the effect of the light polution in Copenhagen Denmark area. Total exposure time ~5 Hours, divided into LRGB 5. min. subs=39,8,8,8.